The largest of all cats and one of six remaining tiger subspecies, the Amur tiger is a top predator of far eastern Asia. With thick fur, and padded paws, this northern cat is well protected against the bone-chilling cold and icy winds of winter. Amur tigers are carnivores. They eat mostly large mammals, especially wild boar and deer. But when food is scarce or a hunt goes badly (many do), they may turn to smaller prey such as rabbits or to carrion. 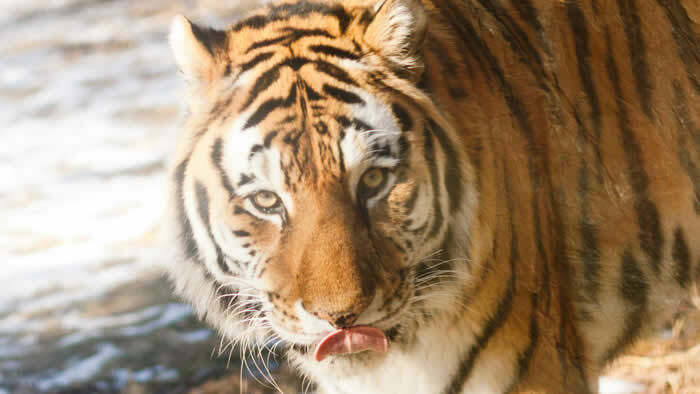 Amur tigers thrive in temperate forests (similar to central and northern Minnesota) that are large and healthy enough to support abundant populations of deer and other prey. Once spread across large areas of Asia, the tigers are now mostly limited to the northern end of their ancient range. They require dense woodlands and open fields, and each male covers territory of up to 400 square miles. Tigers travel over extensive territories in search of food. They hunt using stealth, speed, and sheer strength. With thick fur for warmth, stripes that render it hard for prey to identify, powerful leg muscles for stalking and springing, superb hearing and night vision, and sharp teeth and claws, these animals are well adapted to their role as top carnivore of Asia’s eastern forests. 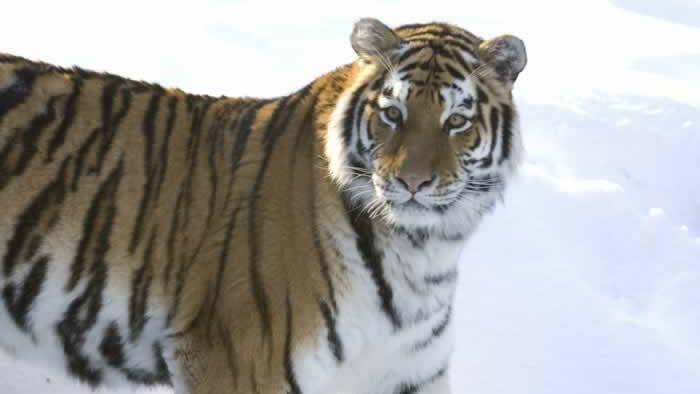 The Amur tiger’s need for large areas of wild land, reputation as a threat to livestock and humans, and value to hunters caused its population to drop to between 20 and 30 in the 1930s. In 2005, biologists estimated 360 in the wild. Though still small, this number proves that even a tiny population can rebound if protected. Tigers use their rough tongues to clean their fur and rasp meat off bones. No two tigers have the same stripes. The skin as well as the fur shows the animal’s unique striping pattern. When they walk, tigers often place their hind feet in the tracks of their forefeet. Unlike most cat species, tigers like water and are good swimmers. Endangered Amur tigers hovered on the brink of extinction in the 1930s and 1940s. With conservation efforts in place, their numbers have improved. But they are still at risk from poaching, loss of prey, and disease. Poaching of tigers for their skins, bones, and other parts, as well as poaching of their wild prey species is driving the decline of this subspecies. Amur tigers are also threatened when roads are built for logging. This provides more access for poachers to find tigers and their prey. 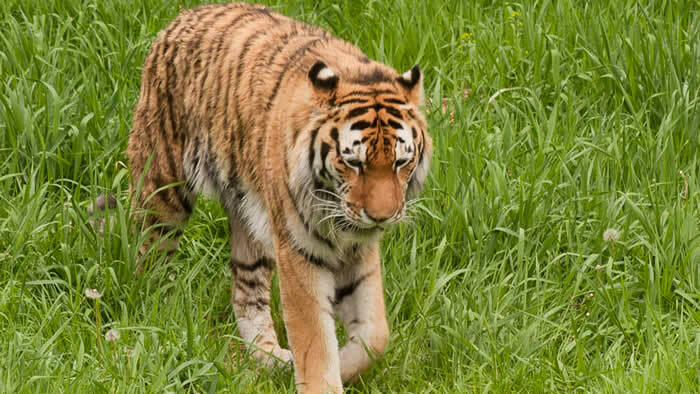 The Minnesota Zoo has long been a leader in tiger conservation. At the Minnesota Zoo, our Vice President for Conservation coordinates the Tiger Species Survival Plan(SSP). Under this program, zoos work together to save species through cooperative conservation breeding programs. The SSP coordinators use genetic and family-tree information to determine which animals should be paired together to mate for the benefit of the entire species. The Tiger SSP coordinates the efforts of more than 100 North American zoos and aquariums. The Tiger Conservation Campaign is also coordinated by the Tiger SSP. The campaign raises awareness about the plight of wild tigers and funding for their survival. Supported conservation projects focus on saving three of the most endangered tiger subspecies: Amur, Malayan, and Sumatran.